SAML V2.0 Assertion example from "E-Authentication Federation Architecture 2.0 Interface Specifications"
In the new interface specification there are several examples and one of them are of a SAML V2.0 Assertion. Examples are often great eye openers because it enables the possibility to reverse the learning from the top-down reading to What's that I'll have a look at that first and ofcourse the ahh, it's just that simple. The example is very hard to read because of redundant namespace declaration cluttering the real content, and forcing it into three PDF pages doesn't help. The example also isn't well formed because the closing tag to <ds:X509Certificate> has somehow been abbreviated to </ds:X59Certificate>. Fixing this, cleaning up the namespace declarations to the minimum and adding schemaLocation references, makes the example much simpler to read and possible to validate. This is the X.500 commonName attribute, which contains a name of an object. If the object corresponds to a person, it is typically the person's full name. The displayable full name of the end user. In the case of assurance level 1 this may be a pseudonym. First name followed by optional middle name or initial followed by last name delimited by spaces. MUST be <=256 characters in length. This is a bit confusing. For one this name isn't used in the example, whereas the example uses us:gov:e-authentication:2007:cn that can't be found as a valid attribute name in neither section "1.7.3.4.1 Required Attributes" nor in section "1.7.3.4.2 Optional Attributes". Since the URN contains 2007 i guess that it can't be a legacy issue, and so either the text or the example is correct, but I can't tell which. Any way they want to describe common name, so why don't the follow the X.500/LDAP Attribute profile, since that what it's made for. Directories based on the ITU-T X.500 specifications [X.500] and the related IETF Lightweight Directory Access Protocol specifications [LDAP] are widely deployed. Directory schema is used to model information to be stored in these directories. In particular, in X.500, attribute type definitions are used to specify the syntax and other features of attributes, the basic information storage unit in a directory (this document refers to these as “directory attributes”). Directory attribute types are defined in schema in the X.500 and LDAP specifications themselves, schema in other public documents (such as the Internet2/Educause EduPerson schema [eduPerson], or the inetOrgperson schema [RFC2798]), and schema defined for private purposes. In any of these cases, it is useful for deployers to take advantage of these directory attribute types in the context of SAML attribute statements, without having to manually create SAML-specific attribute definitions for them, and to do this in an interoperable fashion. The X.500/LDAP attribute profile defines a common convention for the naming and representation of such attributes when expressed as SAML attributes. Maybe they don't want the X.500/LDAP common name but they're own one, or product support is lacking (conformance requirements on the Attribute profiles are unclear to me) or (in theory) they could have missed it. The us:gov:e-authentication:basic:assuranceLevel attribute is present and correct and the last required attribute us:gov:e-authentication:basic:specVer is - ahem, well I guess the idea was that us:gov:e-authentication:2007:specVer should be it. Here's another attribute naming that's unclear, and in fact the last attribute in the example us:gov:e-authentication:2007:PSSN is also different from the best guess in the optional attributes section, where it's called us:gov:e-authentication:basic:PSSN (The last four digits of the end user’s social security number). It's said that the power of examples are great and I generally agree, even though this example or specification needs a revision. Maybe I gather energy to go through the rest of the example some time later, but the four attributes has been more than enough fore now. There's a new version of the SAML V2.0 X.500/LDAP Attribute Profile. It can also be found on the TC homepage under Additional Profiles, Bindings, and Extensions Being Produced by the SSTC. The document has been through a 60 day review that ended on March 7 2007, approximately 2.5 months ago (the document carries the data 19 December 2006 both in text and PDF Document properties). As required by the OASIS Technical Committee Process, the approved errata represent changes that are not “substantive”. The changes focus on clarifications to ambiguous or conflicting specification text, where different compliant implementations might have reasonably chosen different interpretations. The intent of the Security Services TC has been to resolve such issues in service of improved interoperability based on implementation and deployment experience. where the last issue deprecates [SAMLProf] Section 8.2 (lines 1677-1799). The note on E53 says "This attribute profile is deprecated because of a flaw that makes it schema-invalid", ahem, but what exactly is the flaw? I started by a general search but found nothing, then i looked at the public mail archives in hope that i would have been described there but nothing there as well. Then I startet getting some sense when I looked at the other two issues. The issue E39: Error in SAML Profile Example is weird in itself. This is under XACML Attribute Profile but shows that a single SAML attribute can conform to multiple attribute profiles when they are compatible with each other. To be honest this sounds confusing to me, but I haven't really digged the deeper knowledge of attribute profiles and that's something I look forward to. This is in the profiles specification but the namespace for the X.500/LDAP Attribute profile is wrong. It's not urn:oasis:names:tc:SAML:2.0:profiles:attribute:LDAP but urn:oasis:names:tc:SAML:2.0:profiles:attribute:X500. This aside the point should be to place the encoding attribute based on the X.500/LDAP Attribute profile on the correct element, but it turns out to exactly the opposite, by placing it on saml:AttributeValue. The second issue E48: Clarification on Encoding for Binary Values in LDAP Profile is a clarification for non utf-8 encoded LDAP attributes, but that could be fixed with an updated paragraph, so what is the flaw in E53?. It's sort of inconsistent that the example isn't annotated as well, but the original example (prepared for direct XML Schema validation) in section 8.2.6, gives the following validation error with Xerces. cvc-type.3.1.1: Element 'saml:AttributeValue' is a simple type, so it cannot have attributes, excepting those whose namespace name is identical to 'http://www.w3.org/2001/XMLSchema-instance' and whose [local name] is one of 'type', 'nil', 'schemaLocation' or 'noNamespaceSchemaLocation'. However, the attribute, 'x500:Encoding' was found. Here's room for extra attributes with the <anyAttribute>. The updated example from the new document does validate. So in summary, the original profile dictates that the attribute should be placed on the wrong element and it's followed in the example. This is corrected in the new document, but I can't see why this couldn't be treated with normal errata, but that must be due to the OASIS guidelines. The original XACML example should be corrected as well, including the erroneous namespace to a valid XACML Attribute profile example. The E-Authentication Architecture called Technical Approach for the Authentication Service Component has been revised to Version 2.0.0 (May 4, 2007) replacing Version 1.0.0 (June 28, 2004). In this post I'll have a quick look at what I see has changed. Be aware that I'm no E-authentication or SAML expert, so I may miss important points. The PMO is planning to phase out this adopted scheme some time in 2007 in favor of a SAML 2.0 based adopted scheme (see Section 3.2). A migration plan will guide Federation members and COTS vendors through the transition. That's within the next 6 months, so hopefully everyone has updated and SAML V2.0 conforming software. The streamlining to SAML V2.0 does simplify things and SAML V2.0 support should soon become more widespread (even Google is using SAML V2.0) and adding SLO is very nice, but I can't figure out the business need to phase out the old schema already in 2007. Within the ASC, SAML-based identity schemes are associated with authentication using PINs and passwords. PKI is associated with authentication using X.509 certificates. However, to support use of higher assurance level credentials by lower assurance level RPs, the ASC allows use of assertionbased mechanisms when X.509 certificates are used for authentication (see Section 2.4.2.1, Scheme Translators). I have no experience deploying SAML V2.0 with neither Artifact nor POST, so I can't in any way argue with what they've discovered during they're research, but I does surprise me if these are major issues. This adopted scheme uses the SAML HTTP POST binding as the communication mechanism for a CS to pass a SAML assertion to an RP. The HTTP POST binding defines a mechanism by which SAML protocol messages are transmitted within the base64-encoded content of an HTML form control. This adopted scheme uses the SAML HTTP Redirect binding as the communication mechanism for passing a SAML authentication request from an RP to a CS. This is the minimum required by [SAML2 Conform]. In addition, this adopted scheme uses the SAML HTTP Redirect binding as a communication mechanism for SAML SLO request-response message exchange. More details can be found in the E-Authentication Federation Architecture 2.0 Interface Specifications. The E-Authentication project has updated the architecture as covered in my previous post E-Authentication has revised architecture to incorporate SAML V2.0. When i wrote the post I could not find a description of the updated architecture and the new interface specification. Today I found them and here I'll I have a quick look at the documents and the what's new. 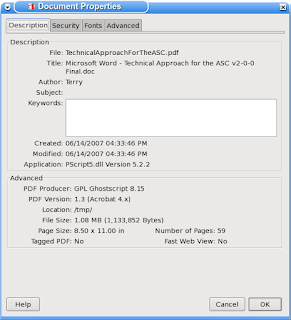 Shows that the PDF was created june 14, 2007 by Terry with the use of GPL Ghostscript. Open Source is certainly being used in government as well - Versions entitled GPL Ghostscript are distributed with the GNU General Public License , also note Ghostscript is a copyrighted work (artofcode LLC owns the copyright); it is not shareware or in the public domain. So by luck I found the news rather quickly (haven't found out where to sign up for the newletter yet). The E-Authentication Federation Newsletter for July brings the happy news New Architecture Approved: SAML 2.0 is Ready for Business. The architecture has been revised to incorporate SAML V2.0 and adds an additional adopted scheme and interface specification. It sounds like the existing interfaces (and schemes) will be kept, but if the architecture is truly changed then these will have to be updated or otherwise the architecture must have been widened to embrace both the current and an SAML V2.0'ish version. The process to revise the architecture was rigorous. The E-Authentication PMO conducted an interoperability event in the Interoperability Lab to determine the capability of various vendors to comply with the SAML 2.0 specification. The E-Authentication PMO also talked with agencies to identify which features were necessary, as well as other features that would be most valuable to them. Working on behalf of the agencies, the EAuthentication PMO discussed the Government’s prioritized requirements with the vendors so they could include those features in their products, resulting in better product capabilities available to agencies. The vendors then participated in another interoperability event to demonstrate their products’ capabilities, their ability to meet the Government’s requirements, and their ability to interoperate with other vendors’ products. A tiger team within the Technical Working Group is now addressing the issues associated with migrating agencies and CSPs to the new architecture. Since 6.0 IE has been aware of P3P policies in deciding whether to accept third party cookies or not. This is a quick look at P3P, based on an example. It's not clear to me exactly what's the case here. It states The P3P Specification Working Group took this step as there was insufficient support from current Browser implementers for the implementation of P3P 1.1.. This is a fair argument but still does uease me slightly since privacy is on the rise. I'll go for the The Platform for Privacy Preferences 1.0 (P3P1.0) Specification, since the group note is not for me until I realize that everybody is following it. Since I'm not implementing P3P (yet) this seems like the one for me, though a clear primer probably would have been best. I usually don't read a spec from end to end, but instead take some examples and follow those into the spec, sort of attacking it from the side based on a search for specific information. In FDIM and third party cookies I discovered the geminus host ndk.hit.gemius.pl has a compact P3P policy that contains P3P: CP="NOI DSP COR NID PSAo OUR IND", so what does that code mean? This way of showing the policy is defined in 2.2.2 HTTP Headers. This is a case of compact-policy-field defined in 4. Compact Policies. This leaves the real meat to be NOI DSP COR NID PSAo OUR IND. NOI is described in 4.2.1 Compact ACCESS and stands for <nonident/>, but that's just a reference to the full policy for 3.2.5 The ACCESS element, and it means Web site does not collect identified data. A policy SHOULD contain a DISPUTES-GROUP element, which contains one or more DISPUTES elements. These elements describe dispute resolution procedures that may be followed for disputes about a services' privacy practices. This element signifies that either no data is collected (including Web logs), or that the organization collecting the data will anonymize the data referenced in the enclosing STATEMENT. In order to consider the data "anonymized", there must be no reasonable way for the entity or a third party to attach the collected data to the identity of a natural person. Some types of data are inherently anonymous, such as randomly-generated session IDs. Data which might identify natural people in some circumstances, such as IP addresses, names, or addresses, must have a non-reversible transformation applied in order be considered "anonymized". Data may be used for this purpose unless the user requests that it not be used in this way. When this value is selected, the service MUST provide clear instructions to users on how to opt-out of this purpose at the opturi. Services SHOULD also provide these instructions or a pointer to these instructions at the point of data collection. Information is retained for an indeterminate period of time. The absence of a retention policy would be reflected under this option. Where the recipient is a public fora, this is the appropriate retention policy. An easy overview for compact policies can be found on the p3pwriter website. I first had A quick look at the Google Analytics Urchin Module and then what give cookiewise for a user in Party cookie - GA a virtual first party. In this post I'll go deeper into this by monitoring the HTTP headers (including Cookies) by using ngrep. User-Agent: Mozilla/5.0 (X11; U; Linux i686; de-DE; rv:1.8.1.2) Gecko/20070312 Firefox/2.0.0.2. If-Modified-Since: Mon, 16 Jul 2007 08:05:35 GMT. Last-Modified: Mon, 16 Jul 2007 08:05:35 GMT. Date: Mon, 16 Jul 2007 21:20:18 GMT. Then comes a request for a dynamic CSS-file, which for some reason contains all the cookies for both GA and blogger.com, maybe because of the CNAME record. Cookie: __utma=150635877.801410967.1184268448.1184496074.1184570589.11; __utmz=150635877.1184570589.11.5.utmccn=(referral)|utmcsr=www2.blogger.com|utmcct=/navbar.g|utmcmd=referral; __utmz=238348806.1184442198.162.32.utmccn=(referral)|utmcsr=blog.sweetxml.org|utmcct=/2007/07/fdim-and-third-party-cookies.html|utmcmd=referral; __utma=238348806.2055646945.1171363119.1184356396.1184442198.162. If-Modified-Since: Mon, 16 Jul 2007 21:12:21 GMT. Last-Modified: Mon, 16 Jul 2007 21:20:19 GMT. Date: Mon, 16 Jul 2007 21:20:19 GMT. Cookie: __utma=150635877.801410967.1184268448.1184496074.1184570589.11; __utmz=150635877.1184570589.11.5.utmccn=(referral)|utmcsr=www2.blogger.com|utmcct=/navbar.g|utmcmd=referral; __utmz=238348806.1184442198.162.32.utmccn=(referral)|utmcsr=blog.sweetxml.org|utmcct=/2007/07/fdim-and-third-party-cookies.html|utmcmd=referral; __utma=238348806.2055646945.1171363119.1184356396.1184442198.162; S=blogger=uttzz-o7dCskolJlCyOmeQ. Date: Mon, 16 Jul 2007 21:20:22 GMT. Cookie: __utma=114544340.2000377505.1184620823.1184620823.1184620823.1; __utmb=114544340; __utmc=114544340; __utmz=114544340.1184620823.1.1.utmccn=(direct)|utmcsr=(direct)|utmcmd=(none). Cache-Control: private, no-cache, no-cache="Set-Cookie", proxy-revalidate. Expires: Fri, 04 Aug 1978 12:00:00 GMT. Last-Modified: Mon, 18 Jun 2007 23:10:08 GMT. Date: Mon, 16 Jul 2007 21:20:28 GMT. The Association of Danish Internet Medias (FDIM) which is responsible for a Danish Internet traffic and audience measurement system. There's a short info page on FDIM in english. This uses a classic third part cookie to the domain statistik-gallup.net. Since this system is be phased out I'll no go deeper into that. A cookie from/to the specific host statistik-gallup.dk. It's time to have a quick look at P3P. 2 //-- Copyright 2007 Google, All Rights Reserved. 32 // The sampling % of visitors to track (1-100).